Fourteen police dogs have been given medals and diplomas in an emotional ceremony in Colombia as they were retired after years of service sniffing out drugs, bombs and bodies. 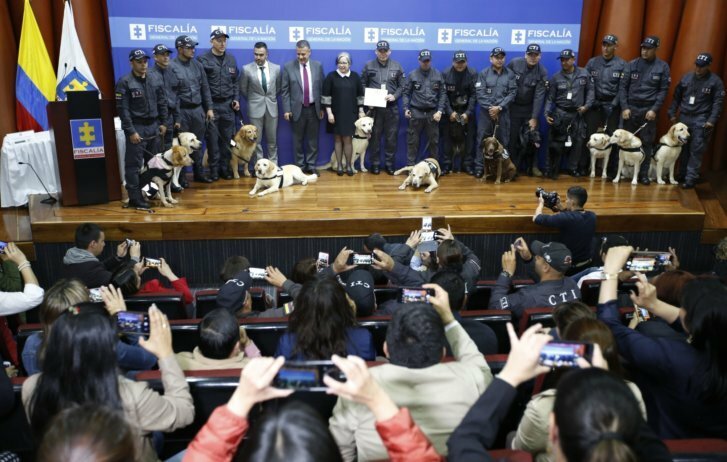 BOGOTA, Colombia (AP) — Fourteen police dogs received medals and diplomas during an emotional retirement ceremony in Colombia’s capital Friday as they wrapped up years of service sniffing out drugs, bombs and bodies. Some of the German shepherds, pit bulls and golden retrievers were treated to special scented baths before they were retired during the event in an auditorium at the Chief Prosecutor’s Office. Among the retired dogs was “Canela,” a 12-year-old Labrador who helped investigators undercover 65 mass graves containing the victims of paramilitary violence, and “Negra,” a pit bull mutt who helped detect several tons of cocaine in her eight-year career. Officials plan to put the dogs up for adoption, placing them with families that will help them live out their retirement years in peace. Some dogs could also be taken in by their former handlers. Police dogs in Colombia often participate in dangerous missions, sniffing out landmines for officers who eradicate coca fields, or rescuing bodies in combat zones. “Sombra,” which is Spanish for shadow, was recently relocated from her base on the country’s Caribbean coast, after drug traffickers, angry over her success at sniffing out cocaine shipments, offered a bounty of $7,000 for her head. Hundreds of dogs serve with Colombia’s police and military. A canine school run by the police near Bogota also provides training for dogs and handlers from other Latin American countries. Colombia’s police dogs are usually retired when they reach eight or nine years old, and in the past they were then kept in kennels where police veterinarians provided them with food, play and medical treatment. But recently, Colombia’s police have been looking for families to adopt the dogs. Earlier this month, the Anti-Narcotics Police put up 50 of its retired dogs for adoption. Adopting families must go through a rigorous screening process to ensure the sniffer dogs are not put to work for private security companies. Associated Press writer Joshua Goodman reported this story in Bogota and AP writer Manuel Rueda reported from Mexico City.